I've been working on this one for awhile. It's nothing major, but I've just been so busy with school, family and all of my little projects that I couldn't really focus on this one. This makeover was inspired by Sara over at Sara's Art House and by Meg at whatever (see where the inspiration for the curtains came from?). If you haven't visited their blogs, please do... very inspiring. 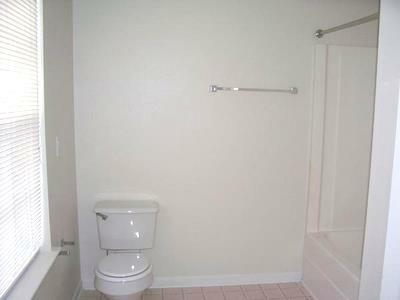 Here's what the bathroom looked like when we moved in. Plain and boring. This bathroom is Han's. A couple of years ago, I did a makeover on it and while I really liked it, it was time for a change. This was the first makeover on it. 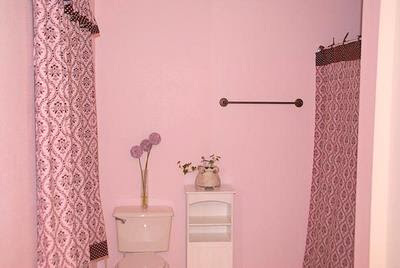 I made the curtains and the shower curtain and painted the walls pink. Now that I'm looking at it, I think it may have gone a little overboard with the pink. Yikes! This time around, I painted the walls white, changed out the ugly, Hollywood looking light, framed the mirror, covered the switch-plates, had Charles hang some shelves, which I added some trim to (well, only one because I didn't buy enough trim for both), and some new blinds, made new curtains, got a new shower curtain and added some fun and colorful accessories. Oh, and I can't forget that faucet that was holding everything up! I also added the chair that I made over so that she has a place to sit to fix her hair and do her make-up (she starts middle school next year so I feel this coming soon). We still need to replace the gross vinyl flooring and repaint the ceiling. The previous owners had all of the rooms painted beige and whoever did the job, used a sprayer and didn't care that they got paint all over the edges of the ceiling and on the floor. To me, it just makes those spots look really dirty. I'd love to do the floor in black & white ceramic tiles, but I'm not sure if Charles will go for it. I bought the material for the curtains on a whim and didn't have any measurements with me so I ended up only getting enough length to make one curtain. I wanted to make them that day and didn't feel like driving all the way back to the fabric store so I cut the width in half. This = skinny curtains. I need to get my tail back out to that fabric store and get more fabric for more panels. The mirror and shelf over the toilet came from GW. The mirror was one of those gaudy gold ones. I sprayed it with Rustoleum Aqua and then did a black wash over it to accentuate the details. The toilet paper holder down there in the floor is my old paper towel holder. Of course, the lamp was thrifted and made over. The towel and shower curtain are from Target. I painted those birdhouses a few years ago and they used to live in my studio. I decided they'd be happier in this room. Those buckets are from Target's dollar bin. I love the how the mirror turned out, but I have one tip for anyone who is doing this. Paint the inside edge of your trim too!! This was a step in the instructions I followed, but I somehow forgot to do this and so now, we have a white border along the inside of the reflection. A close-up for the jewelry tray I made. Do you see how well that toothbrush holder matches??? I've had that thing for years and many times considered shipping it off to Goodwill, but always decided I might need it one day. Turns out, I did need it. See, this is why I have a hard time doing away with things! And here's that chair I made over. It's perfect for this room. Can't forget to include a shot of that faucet! I'm really pleased with it so far and I really love this room. I love it so much, I want to move my bed in here and make it my bedroom! For some reason, I don't think Charles would go for that. Oh my gosh! I was just gonna say, I want to move into that room! But you beat me to it;) I'm still stunned by the beauty of the "pink" version! That was a masterpiece as well! Holy man. I don't know where to start! It's so fresh and fun with pops of color. I can't stand how beautiful it turned out....really amazing work! Great job! I love all of the color! Looks wonderful! What an absolutely gorgeous makeover! I wish my bathroom looked half this good! I love all the colors! Love the lamp and your shower curtain and curtains. I love polkadots! It's just so bright and I was wondering where you were going to use those little birdies. Wow! Love it! All the colors look so wonderful with the black and white! I love the colors in there...they are just so great....at some point I want to update my son's bathroom and I'm pretty sure this is the route I should take....so bright and cheerful. Hey girly, just popping over to see what you've been up to. Nice makeover! I really dig the mirror and the birdhouse...sweet. Love the faucet. . . I am jealous!! Everything looks great!! Does Han just love it? My fave, I'd have to say, if you asked me, which you didn't, but I'll pretend you did, is the jewelry tray. I hafta make one of those before I die. Han has a nice space for primping! You did a great job! It looks so fresh and fun! Love it!! I LOVE it!!! Absolutely adorable. I may have to swipe a few of your ideas for our kids' bathroom. Great job. What a fun space you created! Looks awesome! This bathroom is stunning! I can see why you'd want to sleep in there! The colors are amazing, so bright and cherry, perfect to help you wake up in the mornings! I just love your use of color, you are so talented! I love the colors! It looks soooooo good, I wish I had that bathroom. Great job! If that were for my daughter, I think she'd spend a lot of extra time in the bathroom - good thing you put a chair in there for her! :) very cheerful! Great makeover! I love it! the bathroom seems much brighter and colours make the room POP! What a fun, happy room! Any girl would be happy to get ready for her day in there! Well done! I love the bright cheery accents mixed with the crisp white. What a great space. Polka dots, stripes, AND turquoise?! You hit my favorites!